The largest and most diverse K9 training event in the United States will celebrate 11 years of great training in San Francisco, Ca. Our goal is to top 1000 K9 handlers, supervisors and administrators from around the world. The professional men and women who wear the uniform and serve will join together for one common mission, to train for a better and safer K9 deployment the next time they hit the streets. Our training topics are very diverse and the style of delivering it is unique to the police K9 industry. We provide the agenda for training and you create your own schedule. Find the trainers and the topics that matter most to your training needs and plan out your own three full days of specialized K9 training when you get to Dallas. You’ll have opportunities to meet K9 handlers from around the world and build your own network of vital contacts that can help you grow as a handler or trainer. HITS also offers you the chance to shop and browse over 55 vendors with hundreds of new products. There’s nothing like getting your hands on the products or seeing a demonstration firsthand. We have everything from vendors selling dogs, specialty equipment, and training, to the best in nutrition and safety. 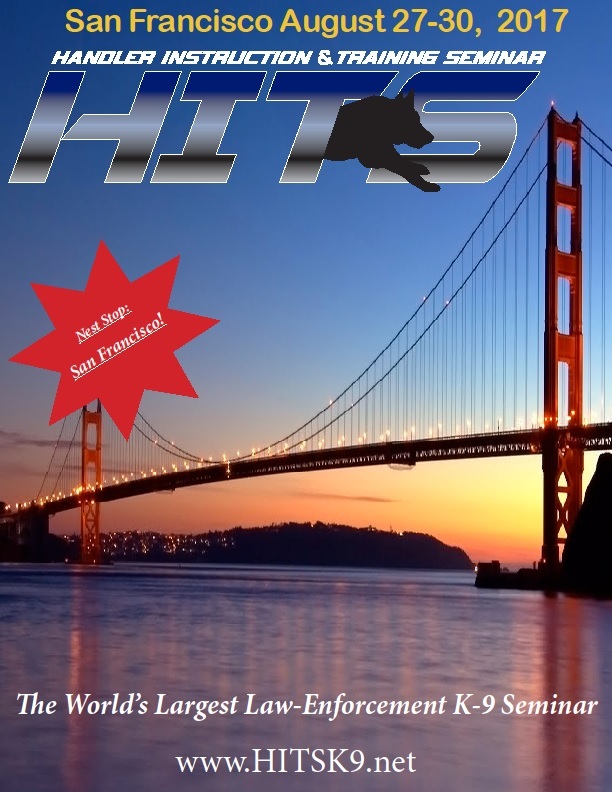 Take a look at our website to get a better idea of what’s in store for the HITS 2017 experience in San Francisco, CA.